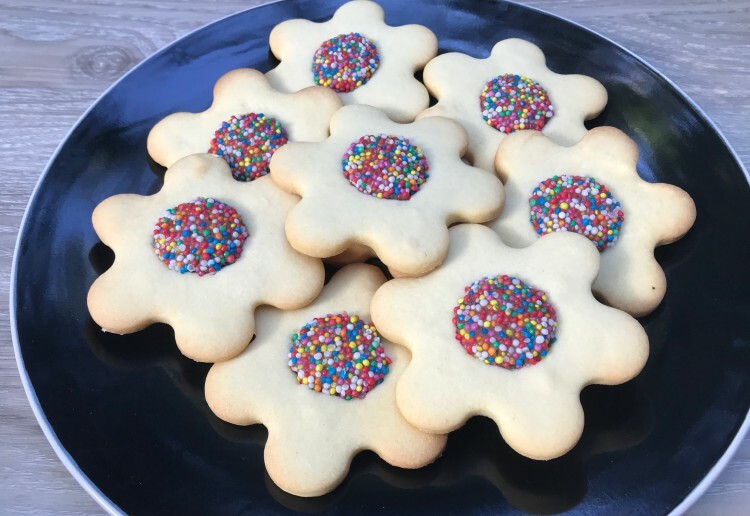 Use our basic biscuit recipe to create these Flower Cookies which are a bright and cheerful treat and are bound to make your child smile when they open up their lunchbox! Sift the flour, cinnamon, baking powder and salt together. In a separate bowl, cream the butter and sugar then add vanilla and most of the egg – gradually. Add the flour mixture and mix to a stiff consistency. Add the remainder of the egg (some milk may be needed if the mix is too dry) and mix to combine. Notes... These biscuits will store in an airtight container for up to two weeks - but I bet you they do not last that long! Love these, made them a few weeks ago. Forgot to take a photo though! These are just too gorgeous to eat. I love these. What a lovely surprise these would be for any child. They look very pretty and perfect for a party! What a simple idea that looks really effective. You are right with teenagers here on the weekend plus heaps of little ones these will go quick. More food for the weekend party, at this rate will have all that I need. Looks yum yum yum thanks! These look so lovely, bright and beautiful. Thanks for the recipe idea! My son loves freckles, he would love these! My girls would LOVE these.